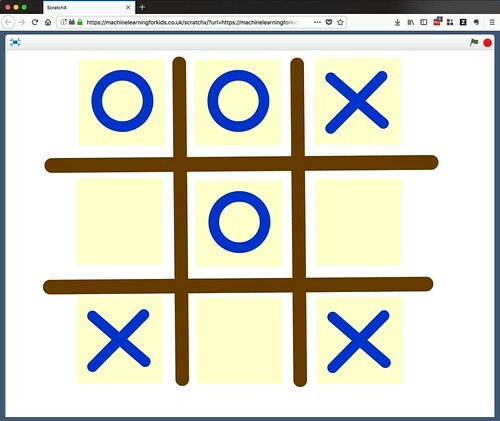 A hands-on demo for use at a small STEM event – letting kids train a simple AI system by playing a few games of noughts and crosses. I prepared an activity for a STEM event in London this week. The idea was to make something for a Science Fair sort of event – where children will be walking past a stand, and might stop for a minute or two to try out an activity. The objective was to come up with a hands-on demo that would enable a volunteer to talk to the children about machine learning. As I’ve written it, I thought I’d share it here in case anyone else might find it useful for another event. It’s based on the noughts-and-crosses activity that I’ve used before. Kids play noughts-and-crosses against a simple artificial intelligence system. The computer uses a machine learning model to decide where to make it’s moves. And that machine learning model will be trained throughout the event using the moves from every game so far.